This project isn’t something that uses a solar panel and uses the produced voltage for some electrical and electronics work. But this project shows how to make a solar panel yourself and what makes it reach maximum performance. A solar panel is a photovoltaic cell where light energy is transformed into electrical energy. Most photovoltaic cells are made of silicon chip above which there resides a very thin layer of noble metal through which around 1% of photon particles enter the material and activates electron flow. Here I’m showing how to make one simple solar panel using transistor. The chosen transistor is 2N3055 in metallic TO-3 package. The below picture shows it’s image. Left: Normal 2N3055 Right: 2N3055 with top removed. 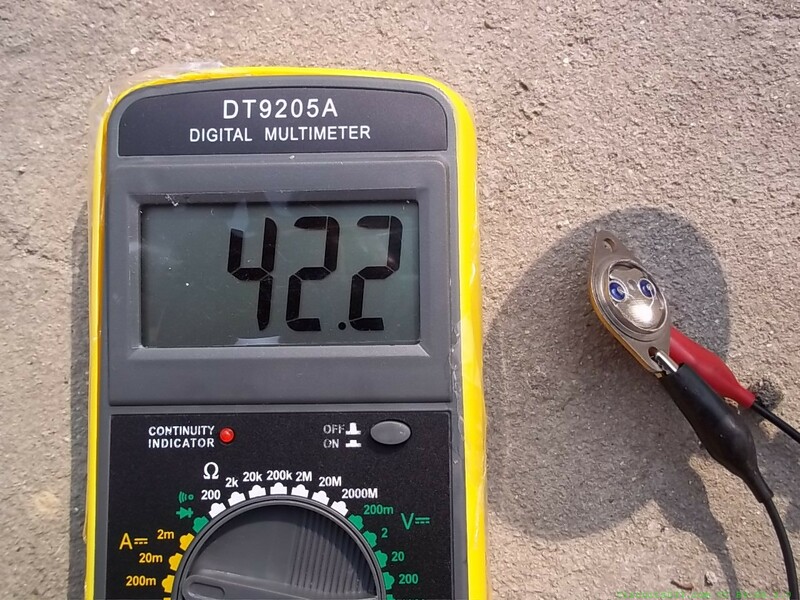 The small silicon chip inside the 2N3055 is able to produce photovolatge when exposed to sunlight and in the cell the emitter becomes the positive terminal and the collector becomes the negative terminal. 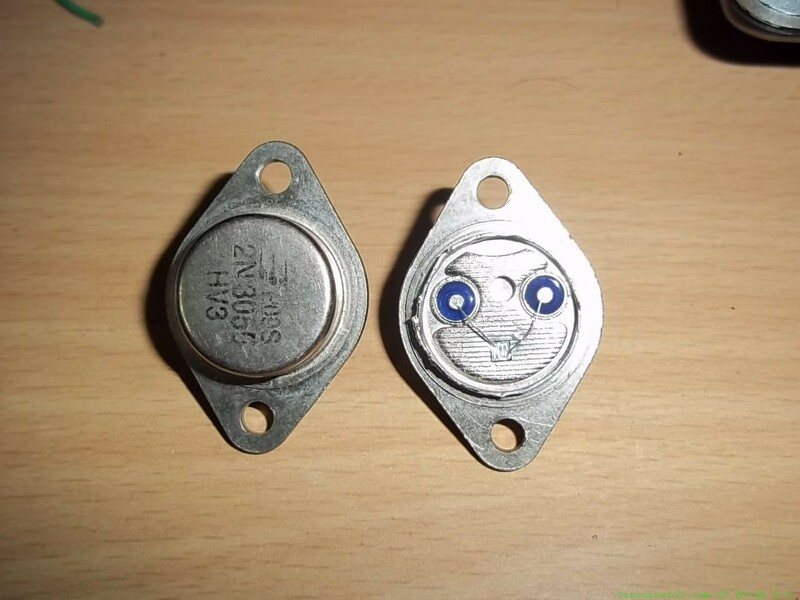 The cell produced open circuit voltage of 0.45 volts which is normal but it produced closed circuit current of only 200uA which is too little to be used in any applications. 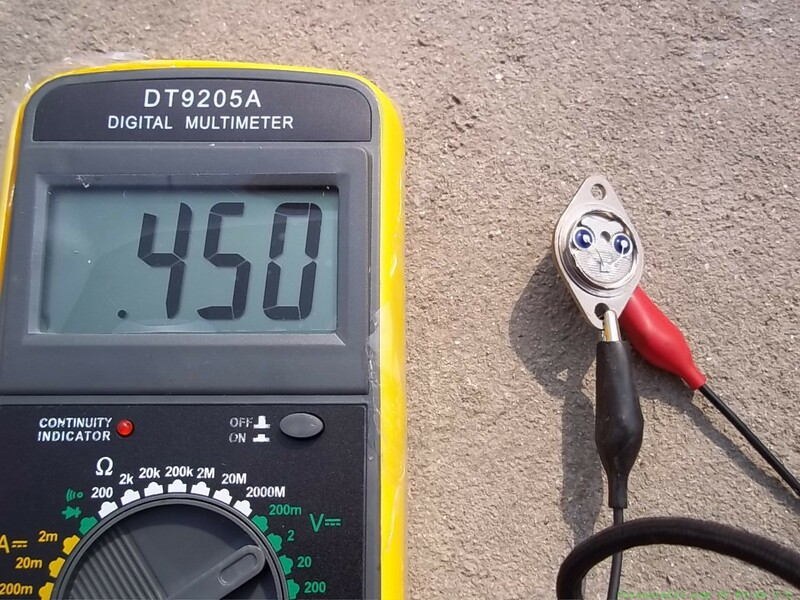 To light a bright white LED we need minimum 10-15mA current and the panel produced only 0.2mA which is not enough. The current depends on the intensity of sunlight and the cell should produce more current if it gets more exposure. Hence I used a magnifier convex lens (+10 diopter, 60mm diameter) and focused the point of sunlight into the silicon square, and the results were surprising. The same cell produced near 0.65 volts which is 44% more voltage and produced 42.2mA current which is 210 times more than the previous one. When the lens focused the light to a 2mm diameter circle, the area of the circle was 2mmx2mmxpi/4=3.14mm^2. The lens was 60mm in diameter so it took sunlight of 60mmx60mmxpi/4=2826mm^2. So the silicon chip got 900 times more sunlight and produces the huge current. interesting arup,very good thats a new idea for me …. I’m afraid I can’t help you as I’m not good experienced in rf technologies. interesting idea. Why don’t you make a mobile phone charge using this?!!!! Basically I am illitertite in electronics but I am using some part of it in my ideas. 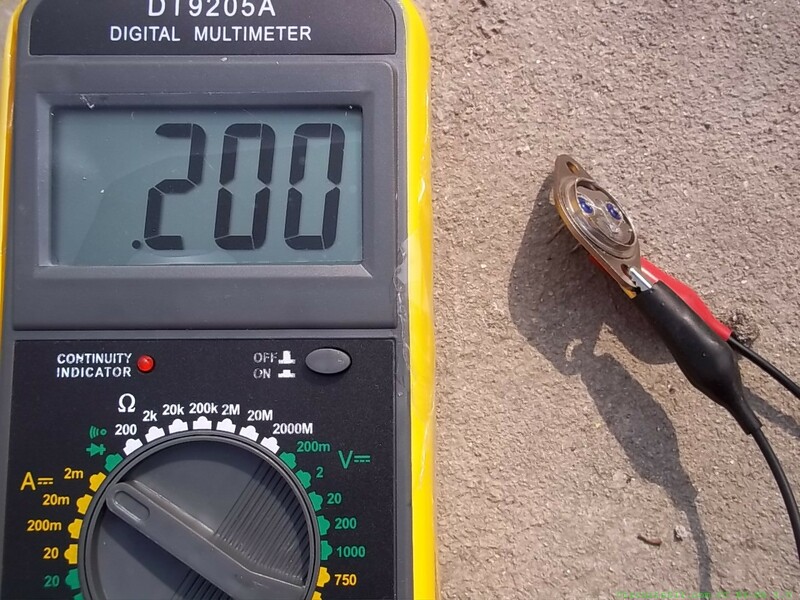 guruji one more question if i store voltage produce by solar cell in battery and convert that stored dc voltage into ac by using inverter and then by using step up transformer we step it up to 220v and then can we connect our home aplliance such as tv to it? When you’re converting the stored DC to AC by an inverter, there’s no need to step up to 220V. The inverter will do that. Yes you can attach a TV, but all these depends on the battery/inverter etc specifications. Projects in magazines are AM radio (worn like a headphone, I really wanted to make one as a kid) and electronic scarecrow (powered by solar battery made of glass diodes and wind generator). 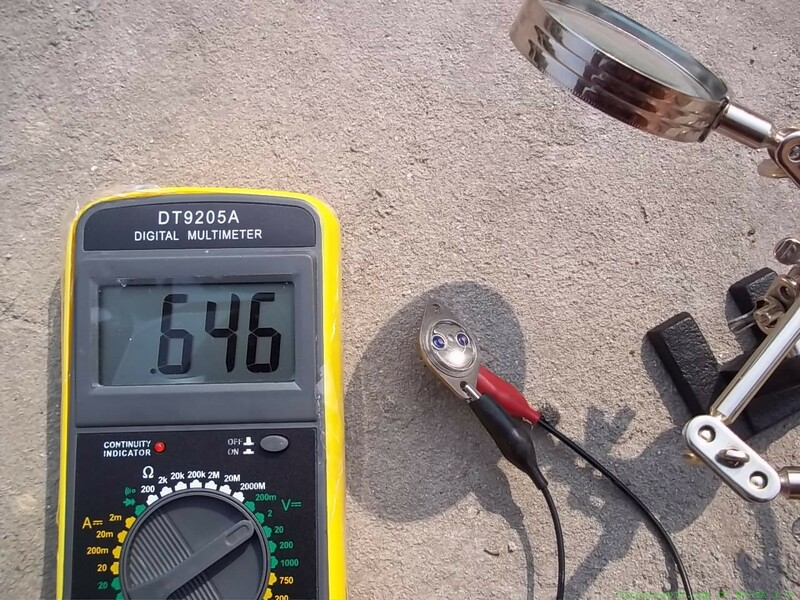 It was good idea 40 years ago when “true” solar cells were not easy to get, today it would be hard to beat even cheap cells from garden lamp ($3 per piece including accumulator, bright LED and some simple controller). Thanks for some other wonderful post. The place else may anybody get that type of info in such an ideal approach of writing? I’ve a presentation subsequent week, and I am at the look for such information. This page really has all the information I wanted about this subject and didn’t know who to ask. we can’t put the lens for continious time as the material will get burn due to overheating, due u have any more idea to get maximum sunlight? or the only thing that connect more transistor to get more current and voltages? Arup, You are a star! Thank you for the “outside-the-box” thinking, and for giving me food for thought and inspiration: I’ll go now and plug in the soldering iron!